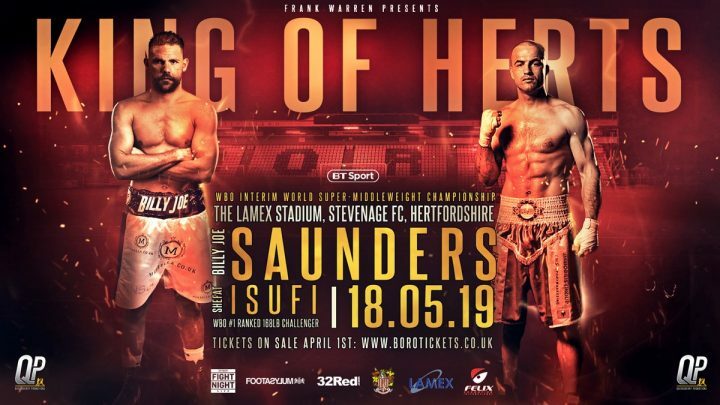 BILLY JOE SAUNDERS will fight Shefat Isufi for the WBO Interim super middleweight world title on Saturday May 18 at The Lamex Stadium, home of Stevenage Football Club, live on BT Sport. For Saunders, 27-0, the big night in the centre of pitch at Stevenage will represent a first professional fight on home turf in Hertfordshire, with the 29-year-old southpaw stylist hailing from nearby Hatfield. The former Southern Area, Commonwealth, British, WBO International and European champion was an undefeated WBO world champion at middleweight, having won the belt in December 2015 with a points victory over former champion Andy Lee. Successful defences followed against Artur Akavov, Willie Monroe jr and, most notably, a career-best performance against David Lemieux on away soil in Canada. He was set to make a further defence last October against mandatory challenger Demetrius Andrade, but eventually opted to relinquish his title after the Massachusetts commission refused to licence him to fight in Boston after an adverse finding in a VADA test, despite the fact he would have been clear to defend under the rules of the British Boxing Board of Control, as well as the UKAD and WADA agencies that govern doping protocols. Saunders returned to the ring in December in a keep busy exercise against Charles Adamu and was recently installed as mandatory challenger for his previous title, with Andrade now holding the belt. He will now break new territory by moving up to 168lbs and seeking to reign at a second weight class. His opponent is the WBO No.1 ranked Munich-based Serbian Isufi, who holds a record of 27-3-2 with 20 KOs. The 29-year-old is the holder of the WBO Intercontinental title and has made two defences of the belt he won by defeating David Zegarra via an 11th round stoppage for the vacant title in July 2017. He has previously fought for and won the IBF European title at light heavyweight, as well as the WBC Eurasia Pacific Boxing Council cruiserweight title. Isufi is undefeated as a super middleweight. “I am very, very happy for the fight, more or less, to be taking place in my home town,” said Saunders on the new venue development. “Stevenage and Hatfield is my area and I am excited to be fighting in front of my ‘home’ fans and I am finally home. “This is my real homecoming from the time I turned pro really. “I know I have got great support there and I look forward to them all coming out and seeing me put on a brilliant display of boxing. I am just happy I am in this position now and Frank (promoter, Warren) has made it work. Saunders was initially set to fight for the full WBO world championship against Isufi following the planned move of the champion Gilberto Ramirez to light heavyweight. After notifying the governing body of his intention to leave the division, the Mexican later retracted his statement, although he will fight for the first time at light heavyweight on April 12 in Los Angeles. Saunders is unfazed by the about-turn and states that he would prefer to personally part the champion from his belt in the ring. “It is what it is and no problem,” he reasoned. “I shall fight this No.1 ranked opponent and I will be taking his spot and then I will fight Ramirez after. Let’s get that fight going on. “If he moves up I would become world champion but I don’t want to win it that way because I want to beat the champion. Promoter Frank Warren added: “I am delighted to be returning Bill to his home patch for what is a significant development in his career. “Moving up to super middleweight opens up all sort of doors for future fights, the massive fights he craved at middleweight where his willingness to fight the other champions was not reciprocated. “Bill has operated at middleweight for a long time now and reached the top, so we both now believe the time is right to expand his horizons and move up a weight. “If he is successful against Isufi – and we are not underestimating the threat he poses – Bill will either become world champion or fight Ramirez for the title should he stick around at super middleweight. Saunders vs Isufi at the Lamex Stadium is subject to licensing and will go on sale via www.borotickets.co.uk on April 1st.